Senate President Mike Thibodeau, R-Winterport, listens to arguments at the Maine State House in Augusta. Senate President Mike Thibodeau and the top Democrat on the legislative panel overseeing the Department of Health and Human Services have requested investigations into reports that the agency was notified that 10-year-old Marissa Kennedy was being abused. Gov. Paul LePage said probes began immediately after Kennedy’s death, though that may not satisfy lawmakers who want to spearhead their own investigation. The requests came on Thursday and Friday after numerous reports of people and agencies saying they had contacted DHHS with concerns about the Stockton Springs girl, who died on Feb. 24 after her mother and stepfather allegedly beat her regularly for months at their home. Sharon and Julio Carrillo are charged with murder. On Thursday, Bangor Superintendent of Schools Betsy Webb said that the district made reports “on a number of occasions” to the department while Kennedy was a student at Fairmount School during the 2016-17 school year. LePage’s office said Friday afternoon in a written statement that investigations internally at the Department of Health and Human Services and by “cross-governmental entities” began immediately after Kennedy’s death. “All findings and recommendations of the investigations will be reported to Gov. LePage for his review and action,” reads a statement from the governor’s office. The Child Death and Serious Injury Review Panel, which was established in 1992 to review cases like Kennedy’s, includes the state’s medical examiner, health care professionals, forensic and mental health clinicians, law enforcement officers, representatives of the legal community and child welfare workers. DHHS is also conducting a review of the case record and conducting interviews with employees who were involved. A second request for an investigation came on Friday from Rep. Patricia Hymanson, D-York, to the Legislature’s Government Oversight Committee. 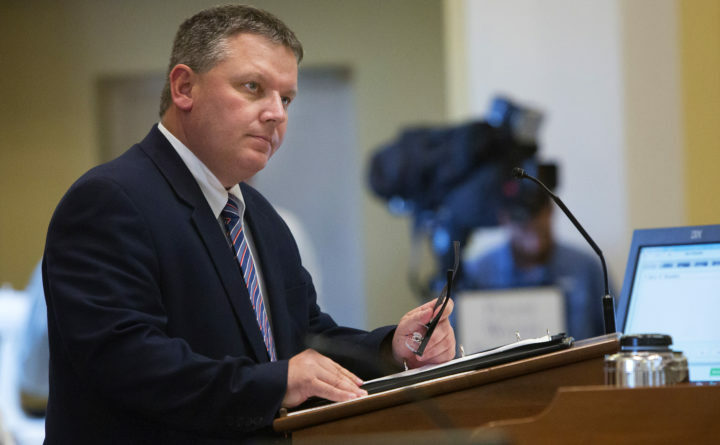 Hymanson, who co-chairs the Health and Human Services Committee, also asked for “a full review of the child protection process” in Maine, citing Kennedy’s case and the December death of 4-year-old Kendall Chick of Wiscasset. Her grandfather’s fiancee has been charged with murder. Sen. Roger Katz, R-Augusta, co-chairman of the watchdog panel, said Friday there are “a number of possible avenues” for a probe, including his committee’s investigative arm, the Office of Program Evaluation and Government Accountability, and the attorney general’s office. Attorney General Janet Mills, a Democrat, said Friday morning that she understood Thibodeau’s calling for a probe but said her office must tread carefully while it is investigating the case, largely because two other children were in the same household as Kennedy was. Mills said the Kennedy case is “reminiscent of the Sally Schofield case.” In 2002, Schofield was convicted of suffocating Logan Marr, a 5-year-old foster child, with duct tape. The landmark case led to widespread reforms throughout the DHHS reporting system. The seriousness of the issue is likely to cause widespread ramifications, including in the race to replace LePage. Thibodeau is vying for the Republican nomination, as is Mary Mayhew, who was Maine’s health and human services commissioner from 2011 through May 2017. On the Democratic side, Mills is also a candidate. DHHS has not responded to questions from the BDN about Webb’s statements or allegations from neighbors of the girl’s family who said they also reported witnessing physical abuse, neglect and intense fighting in the family’s home. LePage’s staff did not respond to questions about Thibodeau’s demand Friday morning.